The 38-day simple moving average of the AUDUSD has held up. 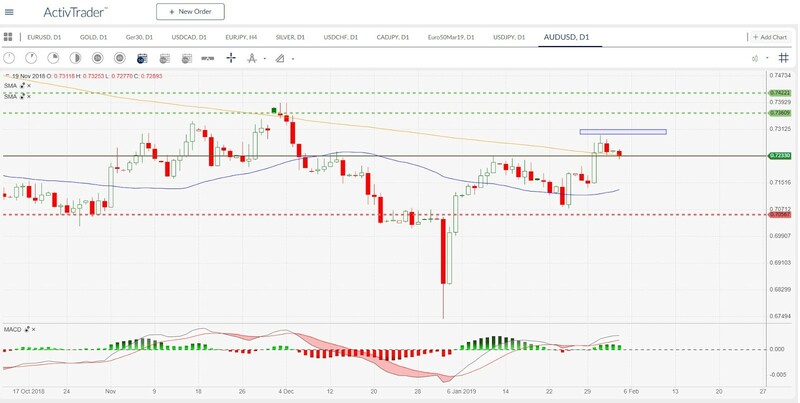 The market looked briefly below the area of the 38 SMA but showed strength the next day and closed with a bullish engulfing candle above the critical support. The next resistance line, the 200-day average, was also started up prompt, and even crossed by closing price. But the smooth 0.7300 level has been a hurdle for the market so far. It is just above the high of last Thursday, and it could not be cleared last Friday. After passing the 38 SMA, the MACD also crossed its trigger line, and the histogram moved into the positive range. This is positive. However, we must not lose sight of the strong effect of the 200-day line as support and resistance. The AUD/USD lost some ground on Friday but ended the week with a substantial profit. The first goal for the coming week is to break the 0.7300 level. The fact that this area was only just tested on Thursday but not cut on the following day may be due to short-term profit taking and some positive macroeconomic figures that strengthened the US dollar on Friday. From a chart technical perspective, it is a positive sign that the market was able to defend its 38-day line, and with a bullish engulfing. The crossing of the 200-day line is also positive, as is the crossing of the MACD. Concerning charting, the 200-day line is a challenge. If the market can defend it, wait for 0.7300. If the market can break through here, the next resistance in the area is 0.736 and then 0.742. However, if the 200-day line is too strong for the bulls, the first support is on the 38-day line. If the market breaks through here, then the next support is in the range of 0.705. Macroeconomically, the US-China trade talks remain a risk factor for the Australian bulls. With the Chinese New Year celebrations, the markets will be closed earlier this week.